IS IT THIS ONE…OR IS IT THAT ONE? A quite frequent problem involved in the removal of small lesions such as moles, nevi and other lesions is…correct identification. 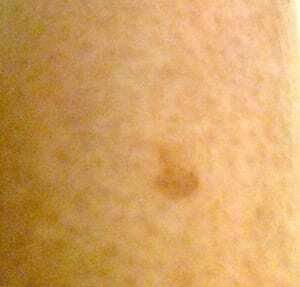 Correct identification and confirmation of the exact site for these small lesions is paramount. But often, this is a problem when a patient is referred from a dermatologist and presents in our office. Identification and Clinical Notes The most common way of locating and identifying the correct site is by asking the patient to identify the site in conjunction with clinic notes. This method is used to help maximize accuracy in the ID process. Problem is…this can backfire. I’ve actually had a patient blow up at me when I asked them to confirm which mole the dermatologist wanted biopsied. But there is an easy solution to this problem. Take a photo (or have someone on staff do it)…of the marked lesion. Include a frame of reference – e.g. the nose, right ear, left ear, belly button – something discernible. If the lesion is hard to find, include a ruler located by the lesion so we can measure from the landmark. This prevents hours of anguish caused from having to revisit the dermatologist and from incorrect lesion biopsy mistakes. Be thankful for modern technology…quite amazing!